Figure 1. Even though mountain goats occasionally cross small streams, large river valleys impede movement and gene flow between ridge systems inhabited by mountain goats. Population genetics is a powerful tool for understanding the biology of mountain goat populations. In 2006, the Alaska Department of Fish and Game began collaboration with Canadian population geneticist Aaron Shafer of the University of Alberta and University of Laval. The Alaska Department of Fish and Game furnished mountain goat DNA samples (i.e. small tissue samples collected during capture activities or submitted by hunters) and other biological data from throughout Alaska. In the lab, Aaron Shafer conducted detailed genetic analyses that ultimately lead to a wealth of information about mountain goat population structure, relatedness and the role of landscape characteristics in modulating movement among populations. This research has revealed a strong degree of affinity to discrete ridge systems indicating that movement across low elevation habitats is extremely limited. For example, mountain goat populations on either side of Berners Bay (a distance of 3.5 miles) are genetically distinct. This occurs because mountain goats are habitat specialists and strongly select steep, rugged terrain and display a strong aversion of flat, open habitats: this is reflected in their genetic patterns. 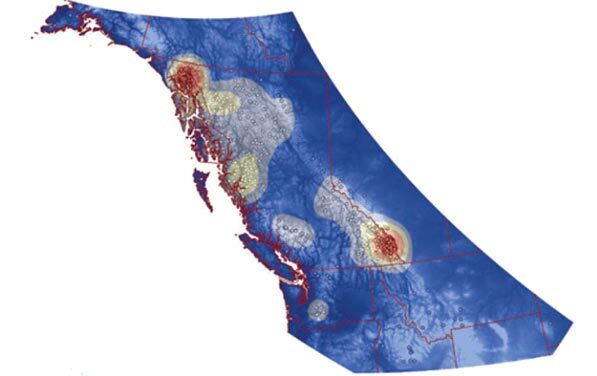 Additional findings revealed that the Haines area is one of two genetic diversity hotspots in North America (the other is located in the Canadian Rockies). 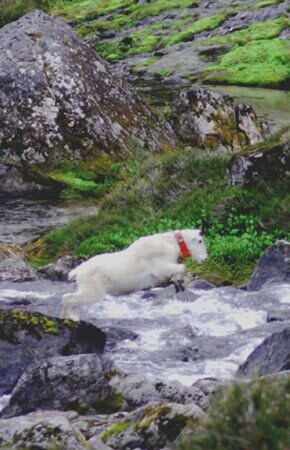 Among the most surprising findings was evidence that mountain goats on Baranof island are comprised of two distinct genetic lineages-one that is a “carbon copy” of the Tracy Arm area (the location from where mountain goats were transplanted to Baranof in 1924) and the other representing a refugial lineage that has occurred on Baranof island since the last glacial maximum. The documentation of a “cryptic refugia” for mountain goats on Baranof island was a surprise because previously biologists believed that the extant population on Baranof island was exclusively derived from the 1924 transplant (though Russian fur trading diaries from the early-1800’s note mountain goats in Baranof island). Overall, understanding the population genetic structure of mountain goats has important implications for management and conservations and will help explain why we see variation in mountain goat body size and horn morphology between different populations in Alaska; yet, more work remains to be done on this topic. The Alaska Department of Fish and Game continues to request tissue samples from hunters throughout Alaska in order to continue this important research. In this regard, hunters play an important and much appreciated role in the continued success of this research project. Hunters can submit small tissue samples (the size of a pencil eraser) to their local ADF&G offices and such samples will be included in the statewide archive. Shafer, A. B. A., J. M. Northrup, K. S. White, M. S. Boyce, S. D. Cote, D. W. Coltman. 2012. Habitat selection predicts genetic relatedness in an alpine ungulate. Ecology, 93:1317-1329. Figure 2. Map showing the location of mountain goat genetic samples, distinct populations and origin. North American mountain goats were derived from multiple population refugia following the last glacial maximum (~15,000 years ago). Mountain goats in Alaska originated from source populations located in ice-free refugia located north of southeast Alaska and, presumably, in an ice-free refugia on the southwestern coast of Baranof Island. Figure 3. Map describing mountain goat genetic diversity across North America (red depicts areas of high genetic diversity). The northern genetic diversity hot spot is located in the vicinity of Haines, Alaska. Figure 4. 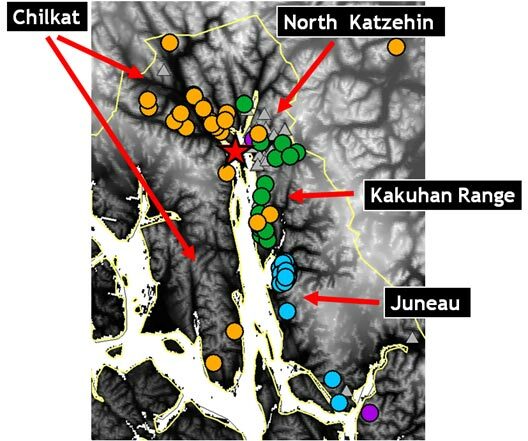 Map showing the location of mountain goat genetic samples collected in northern Southeast Alaska, near Lynn Canal. Samples are color coded based on distinct genetic groupings. In the area shown, 4 genetically distinct populations are described; each population is separated low elevation areas or marine waters (which tend to be barriers to mountain goat dispersal).